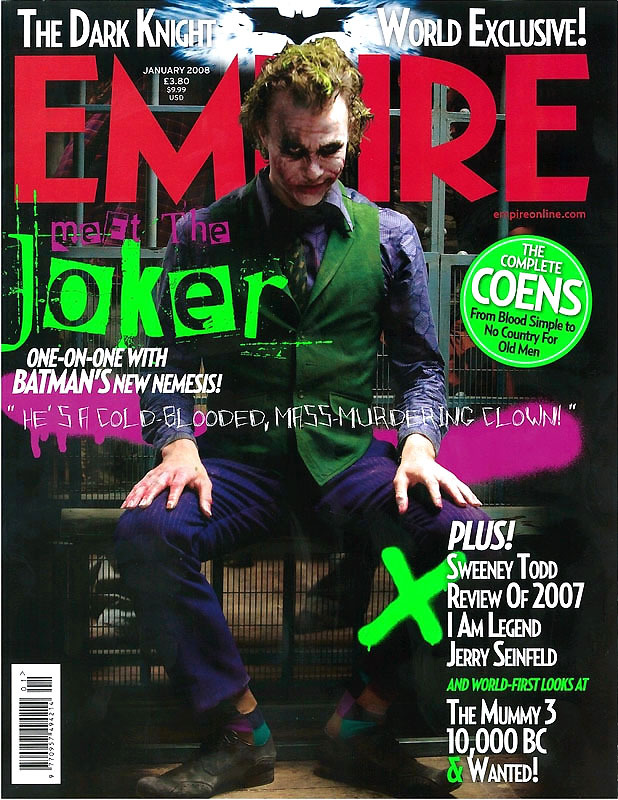 For anyone with reservations about Christopher Nolan's upcoming Batman Begins follow-up, I present to you the cover of the latest Empire magazine, featuring Heath Ledger as the Joker. While this "real world" Joker is nowhere near the cartoony nature of Jack Nicholson's 1989 portrayal, The Dark Knight's Joker is far more menacing. He's a pyschotic murderer, who just so happens to enjoy smearing clown makeup on his face. Whether or not this character is given a hefty backstory is irrelevent. This isn't some thug that got dumped into a vat of chemicals. This guy's just straight-up, bat-sh*t crazy. Pun intended. I was skeptical about the casting of Heath Ledger at first, I admit. But this photo reveals the wiry, unpredictable Clown Prince of Crime of the comics. He’s the epitome of the chaos that Batman fights so hard to prevent. Will the film itself deliver? We'll all find out when The Dark Knight hits theaters July 18, 2008. I'm anticipating The Dark Knight much more than I did Batman Begins.